Updated Nov. 25, 2016 – Walmart is offering Black Friday specials on this model with 4GB RAM for $119 !!! 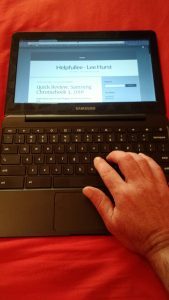 The Chromebook 3 is a helpful laptop option for quick blogging, SEO and light WordPress work. Efficient – Easy and responsive. Great battery life. Quality – Feel and finish and keyboard good enough to make work enjoyable. Good value. Good Size – Big enough to type on , but small and light enough to actually take to couch or bed. Small , light and efficient … and under $200. All day battery life. I have other tools for other jobs , but this is becoming my go to device. I purchased my Chromebook 3 in June of 2016. Google had just announced that they will update the operating system of this machine to run Android apps in the near future. 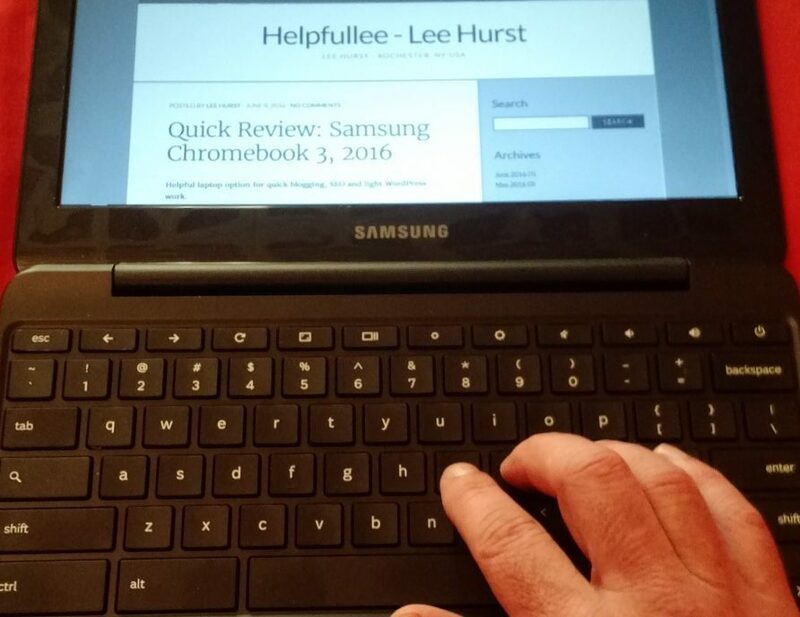 If you are thinking about a new Chromebook you may want to check this list for the Chromebooks that will support Android in 2016. Frankly, I was getting quite frustrated with my main laptop, a three-year-old 17″ HP laptop. Everything seemed to have more friction after the Windows 10 update. I felt like I was driving a Mack truck to the 7-11 ! I have a Nexus 7 tablet , which is great for surfing , videos and as an entertainment controller, but tablets are not ideal for content creation. This is where the Chromebook fits in nicely. Ready to go: Almost instant startup, and the battery last a LONG time. Portable: Small enough to carry around and do work anywhere. Right-Sized: Screen and keyboard good enough to get work done. This works well because I’m doing a lot of content creation. 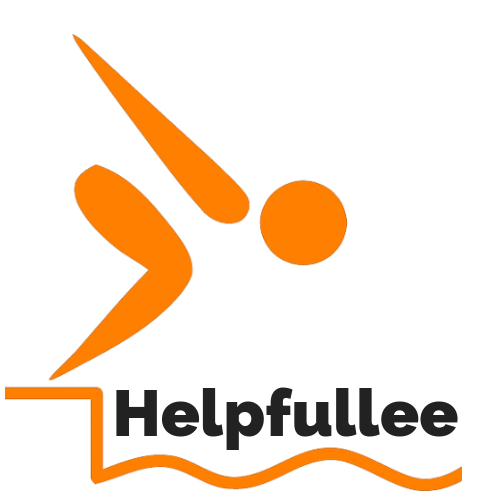 Blogging, light graphics, social media and the occasional video and screen capture. Having very fast internet helps a lot (Thank you, fiber!). Why it may not work for you …. Do not have a fast connection – at least a cable modem wifi class connection . Are trying to do “Heavy Lifting”: Coding and development , or heavy video or graphics. So far I’ve been impressed! I’ve found it to be quite easy to use, and so convenient that I actually use it! I don’t think you will find people raving about it like they would about an Apple , but this machine has a humble workhorse type of attitude. At about 1/6 the price of a mac book , it is a great value. You get about 80% of the functionality of an expensive machine at 20% of the cost. Getting hands on time is vital! The Chromebook 3 is available through Walmart for about $190 . Please note that this is the 2GB version. I probably would have bought a 4GB version if they had stocked them, but I haven’t really noticed any memory issues .